All of our rings and jewellery are available in the following alloys. Shown in the image above, the colours of the metals we work in are very different to each other. Our silver is Sterling silver and is the brightest & purest ‘white’ of the white precious metals we work with. 9ct gold (or 9ct ‘yellow’ gold) is a softer gold tone to that of 18ct gold (or 18ct ‘yellow’ gold). This is because the 18ct option contains a higher amount of pure gold. White gold is not actually a pure white colour (unless it has been rhodium plated – please see below for more information on that). 9ct white gold is a soft colour, with a slight golden tone. 18ct white gold is a deep, metallic tone – quite similar to the colour of platinum but slightly deeper. Again, 18ct white gold contains a higher pure gold content than 9ct white gold. We also work in 9ct rose gold (but not in 18ct rose gold). 9ct rose gold is a soft, yet warm, pink tone. As well as being different colours, the different metals also have varied hardness. Silver is the softest of the precious metals. (We’re always happy to make your wedding rings from silver but you should be aware that silver wedding rings are never as hardwearing as gold ones). Rose gold is also a relatively soft metal in comparison to the other gold options. 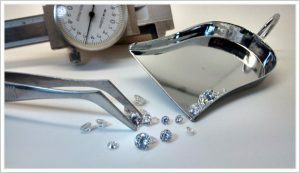 Platinum is the hardest and most durable of the precious metal options. 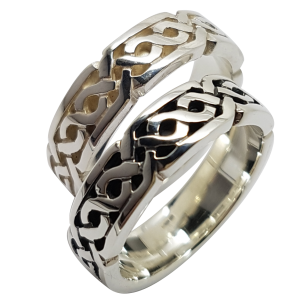 At your request, we can have your white gold ring rhodium plated. This finish is usually applied to white gold rings and jewellery to make them very “white”, as white gold alloys in their true form have distinctive colourings. Please note that as standard we do not rhodium plate our white gold rings. The majority of white gold on the market is plated with rhodium as standard to give it a very bright, white colour. Non-plated 9ct white gold has a slight golden tone and 18ct white gold is a deep, gun-metal colour. Rhodium plating wears off rings and is required to be re-done every couple of years which is why we don’t plate our rings in the first place, and also because we love the non-plated colour for rings. If you are buying one of our rings to wear beside another white gold ring then you may wish to consider requesting that we plate your new ring for you so that the colours match, but please be aware that you will be required to have this re-done in the future. Some silver items, such as solid rings, can be oxidised, this leaves the lower sections black, giving a greater contrast to the item. Your pendant or necklace will be supplied on the chain as pictured. 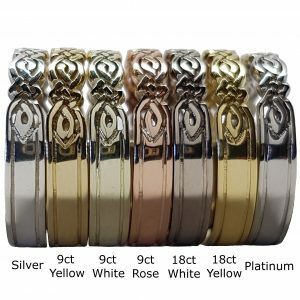 Each item description includes details on the style and length of chain in the photograph for each design. Photographed below is a closer look at the chains we use for our pendants and necklets. (This does not include the chains we use for our heavier weight pieces – these will be described in more detail in individual descriptions). An 18 inch chain is considered to be an average length chain, therefore this is the length we use for most of our pendants unless the piece is designed to be worn at a different length. 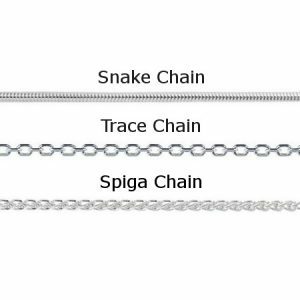 If you would prefer a different length or style of chain, please contact us for more details. 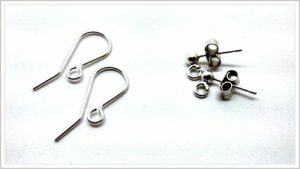 You can select for your drop earrings to be made with either ‘post & butterfly’ or ‘hook’ fittings. 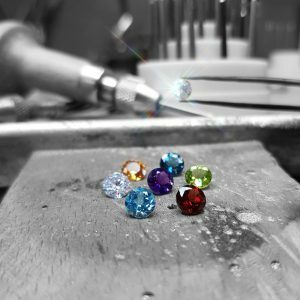 You can select your choice of gemstone from the selection we work with. As photographed, these are (clockwise) London Blue Topaz, Peridot, Garnet, Swiss Blue Topaz, Cubic Zirconia (CZ), Citrine and Amethyst (centre). Alternatively, please contact us if you would like details of any other gemstones. The diamonds we use in our rings and jewellery are of G-H VS/1-2 quality, in sizes 1/8, 1/5 and 1/4ct, please get in touch if you would like to request a different size, shape, colour or quality of diamond. We source our diamonds and gemstones from reputable dealers with assurances that these stones are not from mines and places around the world involved in conflict. This finish creates a “frosted” look to your item and adds texture. 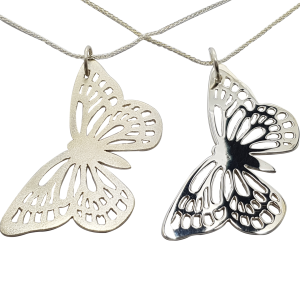 Photographed is our butterfly pendant finished with a satin-finish (left) and polished (right).